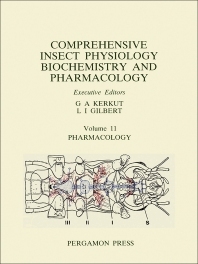 Insect pharmacology comes of age, G A Kerkut. Nervous system, R M Pitman. Neurotransmission and neuromodulation of skeletal muscles, T Piek. Heart and diaphragms, T A Miller. Visceral muscle, H Huddart. Salivary gland, C R House & B L Ginsborg. Microsomal mono-oxygenases, E Hodgson. Biochemical pharmacology, A C Baillie & K Wright. Pharmacology of insect juvenile hormones, K Slama. Acetylcholine receptors, D B Sattelle. Catecholamines and indolalkylamines, C S Brown & C Nestler. Octopamine, P D Evans. Peptides and kinins, B J Cook & G M Holman. Insect venoms and toxins, T Piek. Cyanogenesis in insects, R H Davis & A Nahrstedt. Insect natural products - compounds derived from acetate, shikimate and amino acids, J W S Bradshaw. Species index. Author index. Subject index.